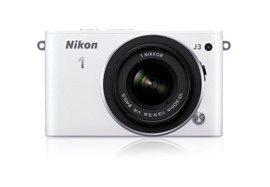 Though five months is a relatively short cycle time for updating an interchangeable lens digital camera, the J3’s predecessor was not a particularly impressive performer or popular camera, so it makes sense that Nikon would want to update it relatively quickly. Unfortunately, not that much has changed in the new model to make it any more appealing. Externally, the J3 looks virtually identical to the J2 (which is still priced at $549.95 with the 10-30mm lens), with the exception of the mode dial, which has been moved to the top of the camera. Internally, however, the J3 now sports the same 14.2-megapixel CMOS sensor as the higher-end Nikon 1 V2 (just as the J2 includes the same sensor as the V2’s predecessor, the Nikon 1 V1). Given that the V2 didn’t really knock our socks off when we tested it, it’s no surprise that the J3’s sensor isn’t really a stand-out in the category either. The updated sensor in the J3 actually performs a bit worse than its predecessor with an Overall DxOMark Score of 52 that’s two points lower than the J2’s Overall Score of 54. While we did note a slight improvement in lowlight shooting, the J3’s more restricted sensitivity range (ISO 160 to 6400, compared to ISO 100 to 6400 in the J2), limits the newer model’s Portrait and Landscape scores measured at low ISO settings. As with its predecessor, the J3’s DxOMark sensor scores show a relatively low dynamic range with a score of 11 Evs. While the lowlight ISO score has improved, coming in at 420 ISO, it still remains low in comparison to the camera’s main competitors – such as cameras in the Sony NEX lineup, Micro Four-Thirds hybrid cameras from Panasonic and Olympus, and the Canon EOS M (EF-M) – scoring a full stop better. One of the biggest changes made between the Nikon 1 J2 and the Nikon 1 J3 is that the J3 now utilizes the same 14.2-megapixel CMOS sensor as the higher-end (and more expensive) Nikon 1 V2 (suggested list price of $899.95 with the 10-30mm lens). Both cameras’ predecessors, the J2 and V1 respectively, also share a sensor (a 10-megapixel CMOS). While the J2 and V1 share an Overall DxOMark of 54, however, the J3 scores two points higher than its big brother, the V2 (primarily due to its higher low-light ISO score), but still comes in below its predecessor as well. Differences are too low to be noticeable on final images. Much of the reason that the J3 performed worse than the J2 can be attributed to the differences in their respective ISO ranges (ISO 160 to 6400 for the J3 and ISO 100 to 6400 for the J2). For instance, the J3 achieved 2/3 stop less than the J2 in the Color Depth test. Two cameras that compete with Nikon 1 J3 are the Panasonic Lumix DMC-GF5, a similarly priced mirrorless interchangeable lens compact camera, as well as the Fujifilm FinePix X10, a high-end compact camera that also lists for about $600. The J3 actually compares fairly similarly to both of these cameras, with the same general sensor quality as measured by DxOMark. The three cameras should be equally well suited for shooting portraits with color depth scores that are equivalent across the board, with the Panasonic GF5 and Fujifilm X10 both scoring 20.5 bits and the J3 coming in at an equivalent 20.4 bits. When it comes to shooting landscapes however, the Panasonic falls behind a bit, with the J3 scoring a full EV higher on the dynamic range test, which means it will give you better details in highlights and shadows. The Fujifilm’s score of 11.3EV is a touch higher even than the J3, but you won’t perceive much of a difference between these two cameras in terms of dynamic range. Performance in low light is a completely different story, however, and this is where the Panasonic GF5 derives benefit from its larger Micro Four Thirds-sized sensor. With a Sports score of 573 ISO compared to 420 ISO for the Nikon 1 J3 and 245 ISO for the Fujifilm X10, the Panasonic clearly takes the lead in low light shooting, performing a half stop better than the Nikon and close to a full stop better than the Fujifilm X10. Note that Fujifilm announced the X10’s successor, the FinePix X20, at CES as well, updating it with the X-Trans CMOS II sensor it originally introduced in its interchangeable lens cameras. Check back soon for test results from the X20. For photographers who are looking for the best image quality from a hybrid interchangeable lens camera, some comparisons of DxOMark results from other cameras on the market reveal interesting data. For instance, when comparing the Nikon 1 J3 with the Olympus PEN E-PL5 (which saw a price drop from $699.99 to $599.99 in December) and the higher-end Canon EOS M, which lists for $799.99, you’ll see that the J3’s performance doesn’t match up to either camera. In fact, the Olympus stands out as a great value, delivering much better performance for the same price. The low light performance of the Olympus and Canon cameras benefit from their larger sensors, with the Canon’s APS-C sensor being the largest of the three and scoring a full stop higher than the J3. In another comparison with two other cameras with APS-C sized sensors – the Sony NEX-6, which sells for $749.99 and the Pentax K 01, which sells for just $449.95 – we can see that the Nikon 1 J3 doesn’t match up in terms of image quality to even the lower-priced offering. Again, the larger sized sensors deliver much better low-light performance, and the Sony and Pentax cameras also outperform the J3 significantly on both color depth and dynamic range. Although the new Nikon 1 J3 has been updated over its predecessor with the higher-resolution sensor found in Nikon’s top-of-the-line interchangeable lens model, its overall performance scores haven’t improved over the J2. The camera seems to be hampered by the reduction in overall sensitivity range and most notably scored 2/3 stop lower than the J2 for color depth. Given that cameras such as the Olympus PEN E-PL5 and Pentax K 01 perform significantly better than the J3 despite being priced equivalently or less, the J3 doesn’t seem to provide a good value per dollar for those seeking the best image quality from an interchangeable lens camera.